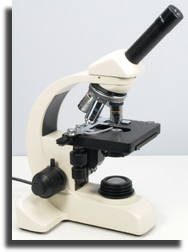 Suppliers of microscopes, stereomicroscopes and microscopy equipment for more than 28 years. 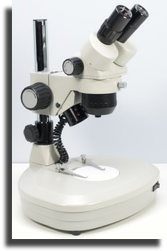 We stock a wide range of light microscopes, microscope accessories, prepared slides, stains and reagents that are suited to the professional and amateur microscopist as well as microscopes suited to educational establishments, industry and research. We are specialists in the field of microscopy image capture and pride ourselves in being the ‘UK One Stop Shop’ for all items relating to the many aspects of microscopes and microscopy. 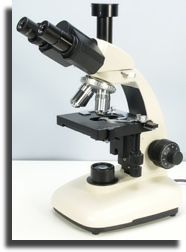 In addition we provide microscopy training programs and undertake on site commercial servicing. If you have specific requirements please choose from the microscope links above. All items shown are available for direct purchase in our Secure Online Shop, and there are links on each page of this web site that take you straight there. For expert and friendly advice please telephone our Helpline and speak to one of our microscope technical advisors and they will be pleased to assist. We are one of the largest independent microscopy supply companies in Europe and are proud of the reputation we have built over the last 28 years. We are open Mondays - Fridays 9.00am to 5.30pm and Saturday mornings by appointment only. If you intend visiting us you will be most welcome, however we operate an appointments system that ensures a qualified member of staff is available to spend time with you. Choosing a microscope can take some considerable time and we would be grateful if you would telephone to arrange a date and time that will ensure that we are able to give you our undivided attention. We are one of the largest independent microscopy supply companies in Europe. A common error for the novice microscopist is to use too high a magnification. The more a microscope magnifies an object, the smaller the part of it that can be seen at any one time. The smaller this area the more difficult it is to decide exactly what the object is. For example a spiders leg magnified x1000 shows only a very uninteresting area of brown or black colouring depending on the exact piece which is being looked at. In many ways this is rather like trying to identify the White Cliffs of Dover from 2 inches away! Only the lowest magnification needed to see the detail required should be used in microscopy. A spiders leg yields far more information magnified by as little as say x20. Remember individual human blood cells can be seen at x500, and the only items needing x1000 are bacteria and some of the very small fungal spores. which can magnify up to x1500 and is used for slide preparations. 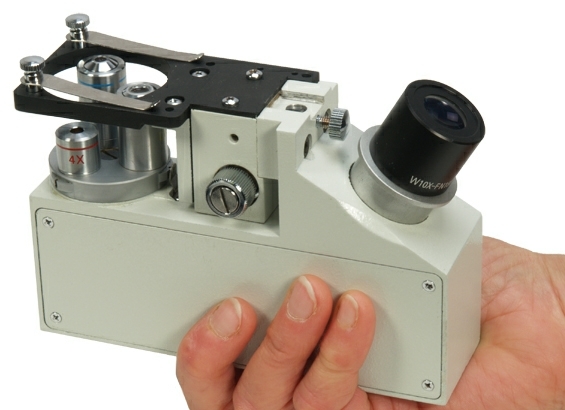 This type of microscope has a much greater depth of focus than a high power microscope, allowing much more of the object depth to be in focus at the same time. Stereomicroscopes utilise this phenomenon using a double lens system consisting of two eyepieces each with their own objective. In the microscope these two lens systems are at a slight angle to one another which produces a 3D effect. Stereomicroscopes are used for looking at whole objects without the need for slide preparation and are ideal for those with a general interest in the smaller forms of nature or specifically for examining insects, flowers, coins and metal objects, etc. Stereomicroscopes are an ideal introduction to microscopy for children who are able to look at any object instantly, and at a relatively low magnification which allows them to make sense of what they see. All too often children are put off microscopes by being given a toy high powered microscope which requires slide preparation, and often gives a very poor result because of the plastic lenses which they use. This sort of microscope cannot be used to look at whole objects which is exactly what the budding young scientist wants to do. 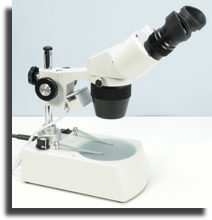 For those who wish to reduce costs, Brunel Microscopes offer a monocular version of the low power microscope - the DM1 this has all the advantages of the stereomicroscope at a budget price and is recommended by the Royal Microscopical Society as essential for Primary schools for which they have a purchase assistance scheme. Compound microscopes are used for examining slide preparations of very thin objects, or slices through larger objects, flattened objects or things which are themselves microscopic. Even at their lowest magnifications they have virtually no depth of focus and cannot be used for examining whole objects with any degree of success. Slide preparations are illuminated from beneath and have to be thin enough to be transparent. Compound microscopes have a turret arrangement to allow different objectives to be rotated into use, a stage for holding the slides and some form of under stage lighting such as a mirror or in built illumination. A typical magnification range may extend from x40 up to x1000. Monocular, binocular and trinocular forms are available and the binocular and trinocular forms are often confused with stereomicroscopes simply because they both have two eyetubes. The choice of compound microscope really depends on the budget figure and the magnification required. However all have standard RMS glass lenses irrespective of price. Binocular compound microscopes are much more expensive than monocular instruments because of the prism arrangement in the head to allow both eyes to be used is a fairly complex system. Binocular microscopes do not necessarily give a better image than monocular, but they do prevent eye strain if the microscope if to used for very long periods, and they are generally only available on the more expensive models. The choice is related to budget and monocular types can be perfectly adequate for most amateur applications. The choice of compound microscope can also be effected by the range of applications available and whether or not more specialised techniques such a phase contrast and dark ground work are required. A scan of the accessories list for each model will show the potential applications. Photography and CCTV can be carried out on virtually all the microscopes in our range and the various attachments are listed. For further assistance please call or E-mail and we will be pleased to help and advise.